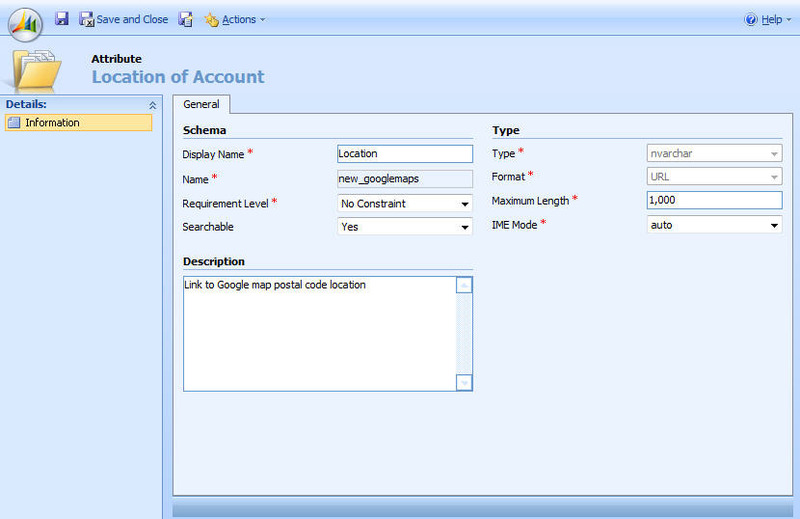 The below is a way to hide a tab to everyone not in the Account Manager and System Administrator roles. There’s also a slightly less polished method to disable fields to everyone not in the System Administrator role. You should be able to copy and paste the below script into your OnLoad event and change the bottom 2 lines of code to specify the tab you want to hide. It wil then hide it from everyone not in the roles specified. You’ll also have to change the attribute names which you want to disable in the HideField function. I wanted a quick way of viewing an Account’s location so I created a link to Google maps based on the postcode of the Account. Edit: it turns out that Richard Knudson has covered embedding maps already on his site!